It's interesting that “Home Soil” is such an overlooked episode, given the fact various Star Trek: The Next Generation creative teams essentially remake it at least three times over the course of the series' run. Its central theme, a debate over whether or not computer technology can develop sentience and self-awareness and should be considered life, leading eventually to a climax that Starfleet and the Federation in general walk away from with egg on their faces, reoccurs as the guiding thesis behind “The Measure of a Man” and “Evolution” and as the B-plot to “The Quality of Life”. Each of these episodes is much better received and remembered than “Home Soil” but, with the exception of “The Measure of a Man” (which has the added benefit of being a high-stakes drama about Data), they're all basically reiterations of it. I've never had a problem with “Home Soil” personally and, of the four episodes, it's actually the one I'm likely to turn on most frequently. While good, “The Measure of a Man” has too much pathos for my particular casual viewing tastes, “Evolution” is a stumbling, rushed, mediocre debut for Michael Piller that doesn't really showcase all of his talents in the best light and is about Wesley Crusher, and while I do quite like “The Quality of Life”, the tech mystery plot about Data and the Exocomps is manifestly not my main attraction to it. This though is a jaunty space adventure with a decent central mystery, some lovely set design and matte work, some fun banter and rapport from the regular cast and another opportunity for the Enterprise to set itself apart from the rest of Starfleet. It's also the natural episode to follow “11001001”, as Star Trek: The Next Generation's interest in technoscientific transhumanism and machine singularities seems to still be lingering: After all, our mysterious alien is *literally* a collective computer consciousness. More importantly, there remains the faintest trace of our Lovely Angels' divine light, as “Home Soil”, just like its predecessor, maintains an ethereal and ephemeral link to Dirty Pair. Namely, to The Dirty Pair Strike Again. I really doubt any of the production staffers this week had read the book (I mean Mike Okuda might have, but not necessarily, as there are plenty of fans of the Sunrise animes who have never read Haruka Takachiho's novels), but it's interesting to compare and contrast the plots of both stories: There's considerably more overlap than you might assume at first glance. Both “Home Soil” and The Dirty Pair Strike Again concern erratic goings-on at a mining colony and a suspicious number of deaths that increasingly seem to be less than accidental. Kei and Yuri/the Enterprise crew get called in to investigate, things get personal once they themselves start to be targeted by the unseen assailants, and our heroes stumble upon a vast conspiracy that has engulfed the entire planet. It's soon revealed that the miners discovered something beneath the planet's surface (in both cases, an entirely unknown, nonhuman collective consciousness) and immediately set about covering it up for selfish reasons: In Star Trek: The Next Generation, as part of an attempt to cut corners and meet quota in a pseudocapitalist system of production, and in Dirty Pair as an underhanded power-grab by an incestuous corporate-state ruling class in an attempt to centralize authority at the expense of the people's spiritual growth. “Home Soil” isn't a note-for-note recitation of The Dirty Pair Strike Again, obviously. For one thing, it's an incredibly reductive and simplified version of the story, with absolutely none of Dirty Pair's trademark ruminations syncretic spirituality. Where Kei and Yuri got to sublimate their existence through futuristic space tantra, the Enterprise crew gets to call out Starfleet for betraying its ideals and committing genocide against the “New Life” it claims to be looking to make peaceful contact with. This isn't any less worthwhile or meaningful a goal, of course (if anything, it's the sort of thing Starfleet and the Federation need to hear more often), but it is a far more gritty and sociological of one. And while this isn't a step back for the show, it does see it in something of a holding pattern for the moment: Episodes like “Haven”, “Where No One Has Gone Before” and “The Big Goodbye” clearly demonstrate it's capable of going the distance in this regard, though perhaps it's not quite comfortable going to the next level yet. Still, it's a far better position to be in then it was just a few weeks ago with “Angel One” (momentarily ignoring the fact it slips back on itself briefly coming up with “When The Bough Breaks”), and the fact Dirty Pair still seems to hang over the proceedings even here is going to prove somewhat prophetic given “Home Soil” is redone so many times. But that's for later-What's important to take note of now is that even though Star Trek: The Next Generation isn't straightforwardly aping the Lovely Angels with this outing, the fact is the comparisons can still be made. And that's evidence of two things: One, the invocation of “The Big Goodbye” is permanent and we *really can't* ignore Kei and Yuri whilst talking about Star Trek: The Next Generation anymore, but also that the show is starting to appear reminiscent of things other than the Original Series. This is sort of a crucial step forward: There are a number of episodes making up the back half of this season that, while maybe not necessarily immediately recognisable as what we might think of as Star Trek: The Next Generation, are also not immediately recognisable as Star Trek, and that's kind of important to take note of. Jonathan Frakes has often said that, in spite of its missteps, the first season was the most experimental and adventurous season the show ever did. And I think I see what he means: Increasingly free of the spectre of Kirk, Spock and McCoy (helped, I'm sure, by accruing surprisingly stellar ratings), Star Trek: The Next Generation starts playing around with the boundaries of its format to see what it can and can't do. Not every experiment has been or is going to be a success, that's the nature of experimentation, after all, but that the show is bold enough here to give some of these things a try really is commendable. There's a sense of avante garde playfulness to some of these episodes that it would have been nice to see a little bit more frequently in the character-driven Michael Piller era and psychologically mind-bending Jeri Taylor era. I'd hesitate to say Star Trek: The Next Generation was ever safe, but it's certainly more safe and less radical than it could have been. The ship has sailed on that: Too many disastrous decisions were made in pre-production for the show as it exists to truly live up to its full potential. But equally, the show knows it doesn't have to be as rote as it maybe has been in the past, and “Home Soil” is the first inkling of this changing status quo. When we're talking about material progress on a social scale, normal measurements of time don't apply. Wherever Kei and Yuri are invoked, things don't immediately get better for everyone. In fact, in the immediate aftermath, things seem to get a lot worse. But this is merely the observer effect trick of the singularity in place once again: A spark has been lit somewhere, and the universe has righted itself. Things will get better, in time. I always liked this one. I like the way the sentiences manifest as blinding points of light, and the way they perceive humans as "bags of mostly water". I think the sentiences are miniature stars. There's a sense in which, when two things are on such an unimaginatively different scale, they can actually be closer to each other than things of nearly comparable scale. That's an extremely seductive concept because it unites religious/spiritual conceptions *and* scientific ones. The cream stirred into the coffee makes patterns like the clouds of Jupiter. The thoughts of a human probably resemble the 'thoughts' of god or nature in the same way. So a microscopic lifeform thinks more like a sun than a man. "To see a World in a Grain of Sand" and all that. I find it interesting to see you say that only a couple of paragraphs after describing the episode in a way that makes it sound like a remake of "Devil in the Dark." Which had never actually occurred to me before reading this post, but now I can't unsee it. I've always liked this episode, and "ugly bags of mostly water" is one of the Next Gen lines I quote most, but my favorite of Next Gen's visits to this concept is the one that does it upside-down and backwards, namely "The Most Toys." "Measure of a Man" is a close second, because I like pathos and I frickin' love courtroom drama. Interestingly enough, there's a bit of an identity crisis in physics at the moment from what I can tell over the fact the types of particles things like the Large Hadron Collider were built to look for might not actually exist and the current particle theory is inaccurate. One idea now being that the interaction of objects at the subatomic scale may indeed mirror those of things at the cosmic. Well there you go. Silly physicists. They should just've asked me. Yeah it's definitely Devil in the Dark, just done a bit differently. In my critical rewatch of last week I never anticipated that I would come out of it believing Home Soil to be the strongest episode of Season 1. But, there it is. The plot is "classic Star Trek", but it's the actual not just nostalgic, but critically good kind of tropish Trek. 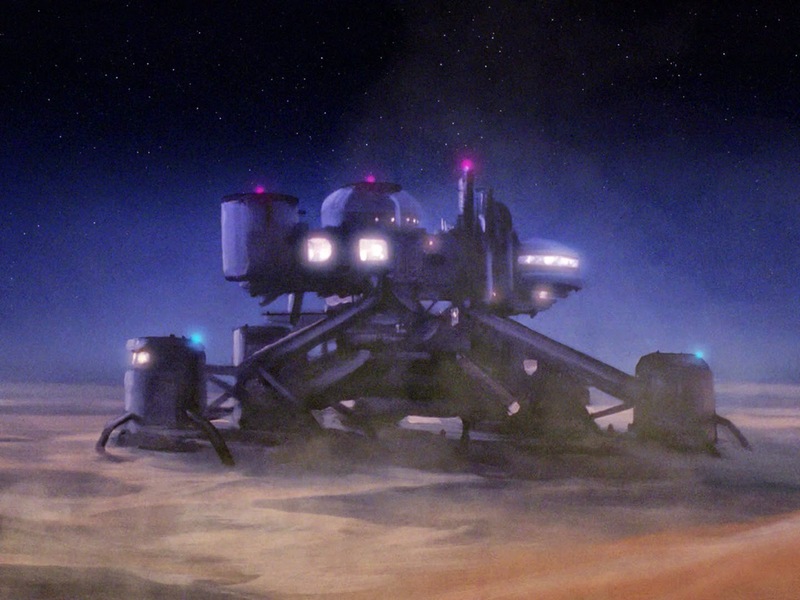 The imagery and designwork for the Terraform station, planet surface, interior, and microscopic creature are superb. The setting itself is a setting that we're seeing more and more and more of in the objects we observe in our own Solar System and really ought to see more of in Trek - the "barren rock". Moreover the Terraformers are wonderfully cast. The mystery plays out beautifully, whether the scientist's apprehension, the malfunction and murder, Data's nice little moment with the laser, and then finally Crusher and Data totally leading the way with the Scientific Method, and Picard's absolute acquiescence to that practice. I'm not sure if the Scientific Method is ever mentioned by name again on TNG. There's great bits of ensemble as Yar's concern for security, or whether or not the scientist might be capable of murder, Troi's insight, and Riker's friendliness are in full, expert display. And Geordi's practically already doing the tech work. I can't think of a Season 1 episode I like more, and it's crazy that Home Soil is so overlooked. But I've found that a few other overlooked ones are leaning toward my second and third and fourth favorites anyway, as we'll soon see. It's just that the TERRIBLE episodes of Season 1 are so much more memorable - memorably terrible. Honestly I will have to, especially on the basis of this essay, go back and look at this episode again as I cannot recall it at all! I am in my catching up of your essays, really enjoying where you are going with things and look forwards to being in real time with you - but maybe that's an illusion anyway, an artefact of the "the observer effect trick of the singularity" and I perfectly in sync.